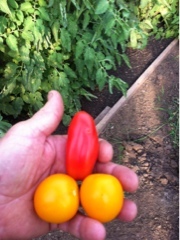 The first full tomatoes of the season feel like they take forever! 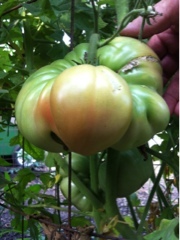 It is nonstop checking and rechecking for the farmer, as we are certain today is the day that green will convert to ripe. In some cases, ripe is orange or yellow. Or a shade of green that converts a bit. Or giant ones slowly, slowly turning to red. 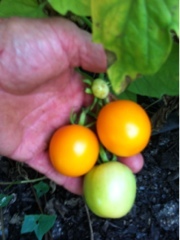 Or the very first of the paste tomatoes, only one ripe one so far. Next week, we are certain more will be ripe. Or not. Fickle things.